Before discussing the 1st day cover appearing in this post I will provide a brief explanation of what they are. In their most basic form 1st day cover consist of a postage stamp, usually on an envelope ,that is postmarked with the date that stamp is authorized for use. Sometimes the release of the 1st day cover may even include a ceremony sponsored by the postal authority who is issuing the stamp. This particular envelope is known as an event cover. Event covers, also known as commemorative covers, instead of marking the issuance of a stamp, commemorate events. A design on the left side of the envelope ( a cachet) explains the event or anniversary being celebrated. Ideally the stamp also relates to the event. Cachets, which were mentioned in the previous paragraph, began to appear as the collecting of 1st day became covers became increasingly popular. The cachet was essentially an illustration that corresponded with the theme of the stamp. Cachets should not be confused with postmarks. Postmarks can only be applied by official Post Offices whereas anyone can design a cachet and place it on an envelope. A cachet makes the cover unique and helps tell the story of the cover.. It can say whether the cover was carried ( for example, the cover featured in this post, was carried on the first mail/passenger flight from Newark to Chicago). The cachet provides context in a way that no mere postmark could. The Newark to Chicago cover (pictured below) came at very exciting time for Newark Municipal Airport. 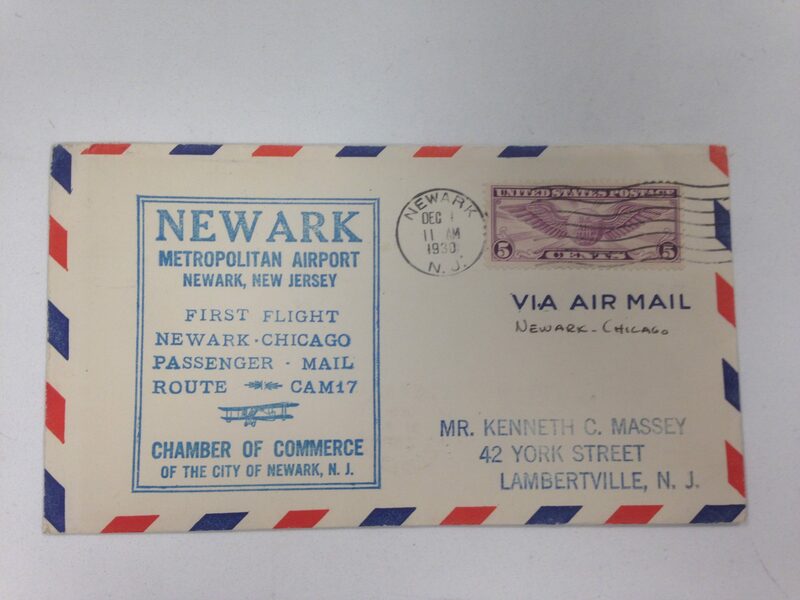 Although the country was sinking into the Great Depression the Newark city fathers were pleased that their airport (only two years old) was becoming the airmail hub for the New York metropolitan region. In fact, at this point in time New York City didn’t have an airport !! The Newark Chamber of Commerce issued the cachet featured below to herald this fact. The stamp is an airmail stamp and the envelope features cancellations from Newark, Chicago and Lambertville( the final destination). The letter was mailed on December 1,1930 and arrived in Chicago December 2, 1930. In our present time of instantaneous communication getting a letter to Chicago in a day may not seem like much. Truth be told it was nothing short of amazing !